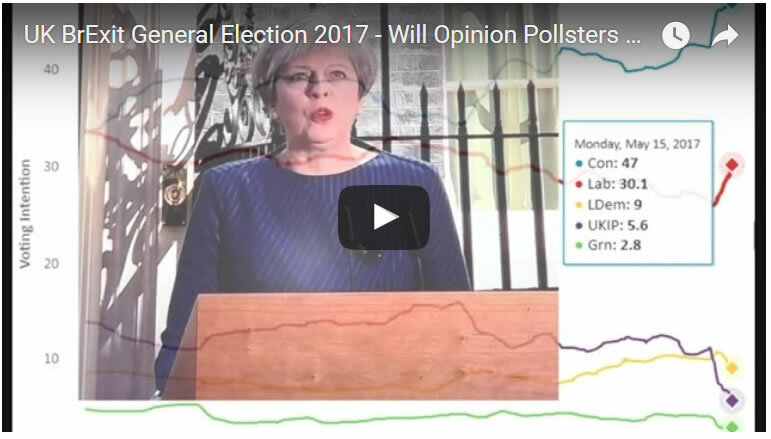 The opinion pollsters are back in force for election 2017, publishing polls on a daily basis that are completely ignorant to the fact that they have gotten virtually every major election very badly wrong for the past 5 years. Where the excuse constantly peddled being that of margins of error, which appear always skewed in the favour of those who commission the polls thus ensuring that the pollsters have gotten the likes of the 2015 General Election, EU Referendum and the US Presidential election very, very badly wrong. More in my extensive video analysis of just how clueless the pollsters have been during the past 5 years. Nevertheless this time the pollsters promise that this time they will get it right, and thus here are the polls based seats forecasts as part of my series of analysis in the countdown to my final UK General Election 2017 forecast conclusion. 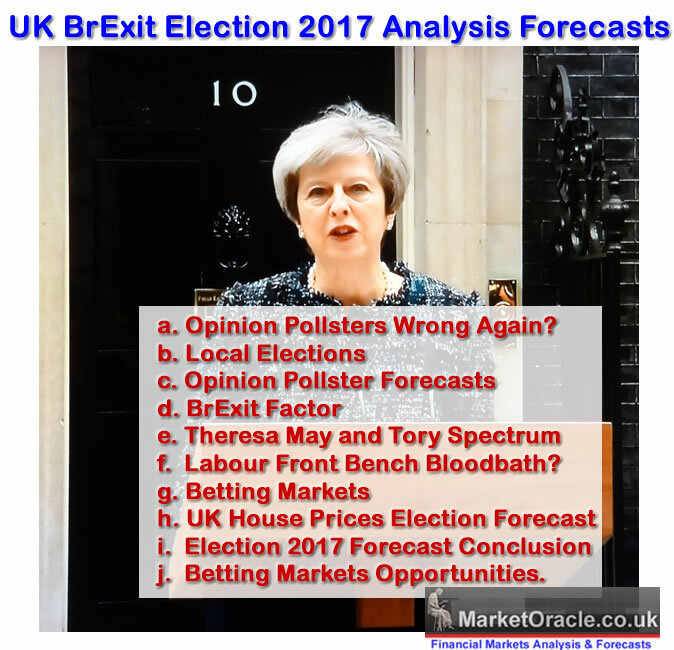 Ensure you are subscribed to my always free newsletter in the countdown to my UK general election 2017 final forecast conclusion and to our youtube channel for videos in this and the BrExit War series. The latest opinion polls show the Tory 20% lead of a month ago has slumped to just 5%! However I consider this to be Polling BS, FAKE POLLS! I have seen this behaviour before, for instance with the Scottish Independence Referendum that the polling industry MANIPULATED into a 50/50 position. Instead my analysis at the time warned that the polls were deliberately WRONG so that the polling industry could sell their worthless pile of dog poop to the gullible masses as demanded by the commissioning broadsheets so that they can sell their garbage to the masses. FAKE POLLING ! The opinion polls paint a picture of a too close to call Scottish Independence vote on September 18th which even saw a 51% to 49% lead for the YES campaign just a few days ago that triggered much panic across the political spectrum and financial markets. So I am going to stick with the average of polls as they are today for this analysis rather than wait for the fake polls to make already weak polling data even more worthless. The running average of the opinion polls has seen a narrowing in the Tory lead from a high of 20% at the start of the election campaign to 17% 2 weeks and currently standing at 13%, with less than 2 weeks to go the trend trajectory implies that the Tory polls lead could be cut further to 10% by voting day. This narrowing is reflected in the revision of the seats forecasts for all pollster based forecasters all of whom dropped their more fanciful forecasts of the Tories winning well over 400 seats to now all forecasting under 400 seats. For instance 2 weeks ago electionforecast.co.uk were forecasting Tories taking 411 seats with Labour on just 158 and the SNP on 53, so have seen a huge shift in their seats forecasts. The opinion polls seats forecasts average at 381 seats for Conservatives and 187 for Labour. Therefore the average of opinion polls based forecasters is still for a Conservative landside victory majority of 112 seats. The bottom line is that the opinion polls based forecasters are experiencing huge volatility for instance a number only a a couple of weeks ago were forecasting a Tory seats total of well above 400 seats, but now all are forecasting the Tory seats tally at under 400 seats. Which means all those who bet on a 400 or more Tory seats win will now be holding potentially losing bets, which illustrates the dangers of relying on pollster based forecasts. So continue to expect very high volatility from the opinion polls based forecasters as they are likely to gyrate all over the place right into the close of the polls on June 8th. Also see my previous analysis in this series on what the Local Election results imply for the outcome of the UK general election.